Have you ever walked into a brand-new building, office complex, or shopping centre, and somehow naturally ended up where you needed to be? While your natural sense of direction might have helped you to find your way, it’s much more likely that you were benefitting from the support of some incredible wayfinding design. Wayfinding systems are an often-overlooked part of the branding process, but the truth is, you’d be lost without them. Literally. Am I close to where I need to be? 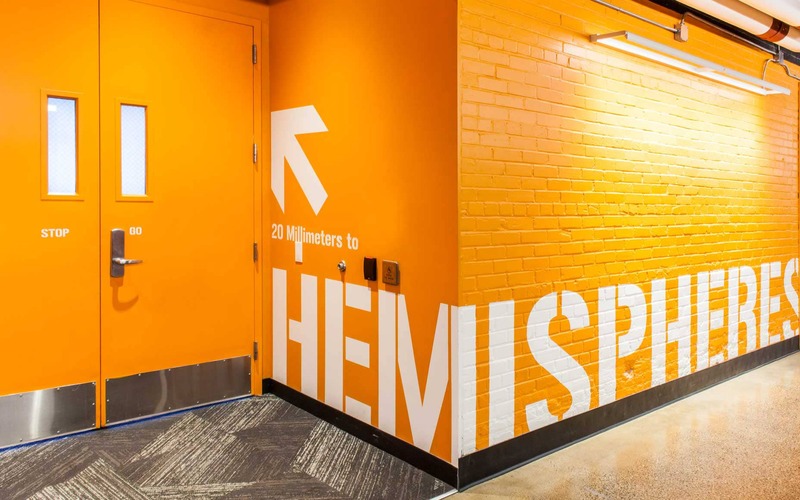 While it’s easy to overlook wayfinding as simply an element of “environmental design”, where companies use graphics and imagery to guide customers in a physical space – it’s also so much more than that. As a kind of spatial problem-solving strategy, wayfinding design is an integral part of the brand experience. After all, as the best wayfinding designers know, the way you guide people around a property is a direct extension of your brand personality. 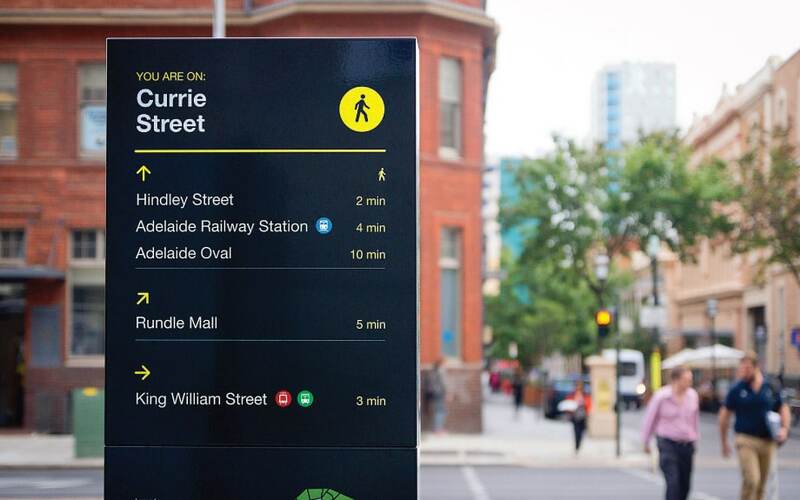 Whether it’s quirky signage showing off your fun and care-free nature, or innovative solutions that demonstrate your technical background, wayfinding can have a direct impact on how people think or feel about your organisation. Here, we’re going to explore how you can take the right path with your wayfinding solutions. 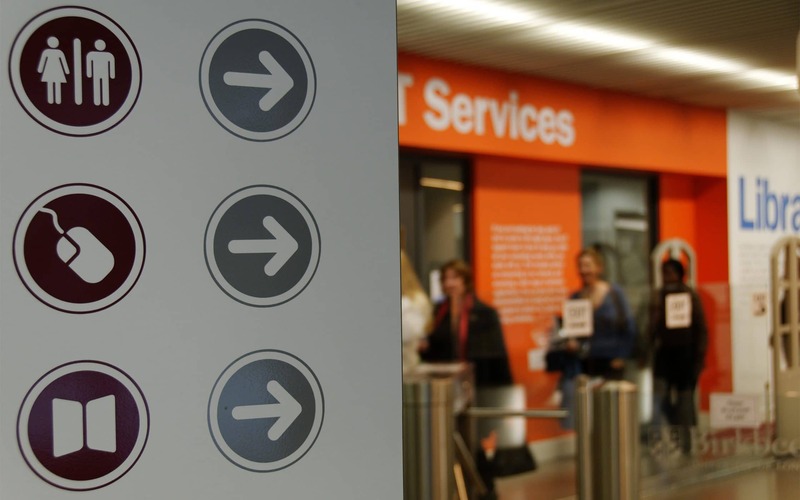 What is wayfinding and why is it so important? 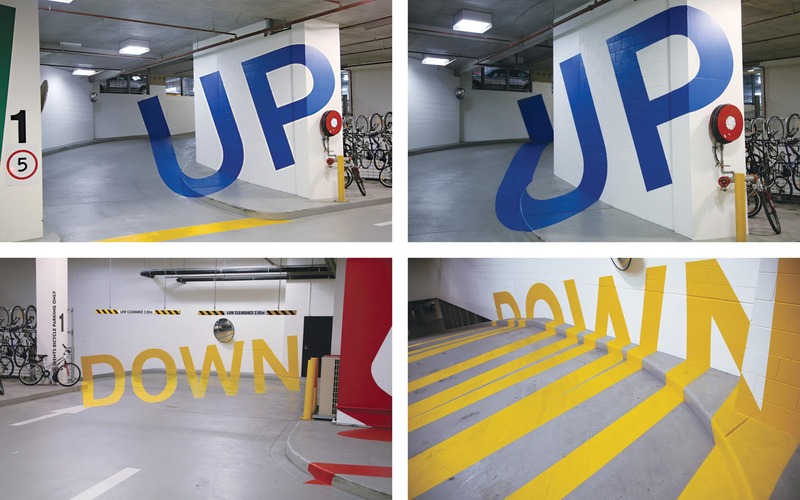 On a fundamental level, wayfinding is about orientation. The right wayfinding graphics show your customers where they need to go when they want to access the lift, visit the CEO in their penthouse office, or simply go to the bathroom. Of course, in addition to its basic functional focus, wayfinding signage can also introduce a brand’s unique tone of voice, contribute to storytelling, and arouse the emotions of your visitors. Create comfort and consistency for customers: The wayfinding design process is about guiding and supporting your visitors when they come to your destination. The right signage helps your user to discover a space on their own, instead of forcing them to ask for help or struggle without assistance. Build brand strength: Working with wayfinding consultants, today’s brands can design simple and effective wayfinding solutions that convey their unique personality, deliver memorable experiences for visitors, and draw focus to the overarching company message. Differentiate yourself: With wayfinding graphics, you can convince your visitors that you run a highly professional and focused business. Great wayfinding is simple, yet creative, allowing you to differentiate yourself from your competitors with carefully crafted moments. 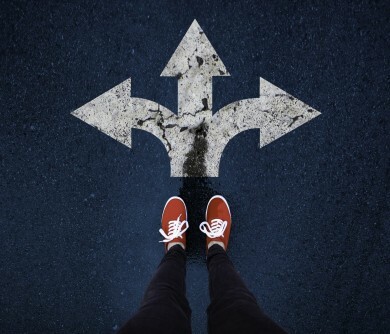 In today’s experience-driven world, the right wayfinding strategy could even earn more word-of-mouth responses on social media, with pictures shared on Instagram, Facebook, and Twitter. Getting lost can be one of the world’s most frustrating experiences. No-one likes feeling confused and overwhelmed – thrown out of their comfort zone and left to fend for themselves. When you’re on a mission to get somewhere, you want your journey to be smooth and simple – that’s where wayfinding systems come in. With wayfinding design, companies can respond to customer pain points before they ever have a chance to emerge. 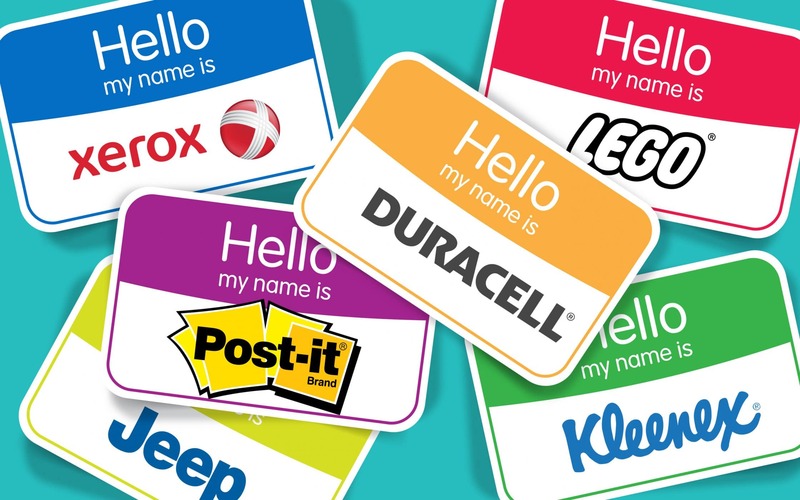 This means that you can avoid any of the bad associations that might crop up when people start to associate your brand name with feeling lost or bewildered. 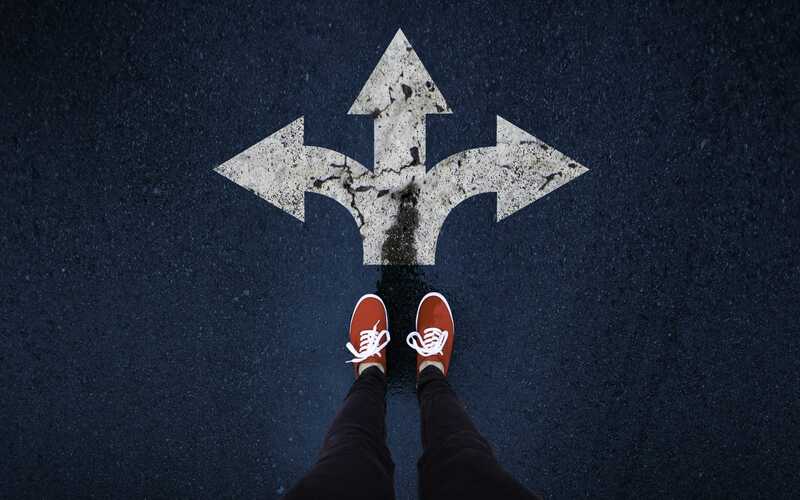 Of course, before you can start working alongside your wayfinding consultants to design the perfect map for your environment, you’ll need to determine what types of wayfinding systems you need. Identify specific rooms – conference rooms, break rooms, restrooms, etc. Provide “you are here” designations on maps at entryways. Identify exit and entry points to a building. Signs in elevator lobbies showing what’s available on each floor. Display signs at junctions offering basic directions. Alert visitors to positive things like free Wi-Fi in an area. Let people know how they can access more information about a facility. Tell visitors when and where to take caution. Signage informing employees of when to take safety precautions. On the surface, the wayfinding design process might not seem like the most exciting aspect of the branding journey. When you’ve got things like digital marketing trends and web design to think about, signage can often take a back seat. However, it’s important to remember that your wayfinding systems can be the key to ensuring that your brand experience is just as compelling offline, as it is in the digital world. 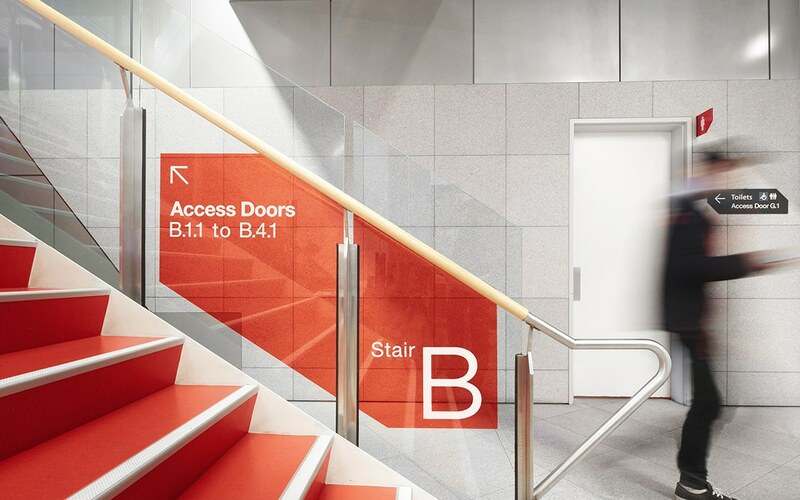 Whether you’re creating wayfinding solutions for a school, a department store, or an office building, there are rules to follow that help today’s wayfinding designers to create powerful branded experiences. Remember, the value of an effective wayfinding system isn’t only determined by a positive and enjoyable customer experience, but also on how brands can take advantage of the interactions that occur during a user’s route. When you design a website for the digital side of your business, one of the first things you’ll need to is make sure that your site is accessible and easy to use. Digital navigation cues like buttons, menu bars, and page tabs all help to guide your user around your site, facilitating a strong user experience. The wayfinding design process is very similar. It involves using specific points and landmarks to help orient someone in their space and help them find wherever they need to be. For instance, when someone arrives at your business property and looks at an entryway map, they shouldn’t only see a blueprint of the paths they can take around the business. They should also see the names of important segments of the building, and what they can find there. 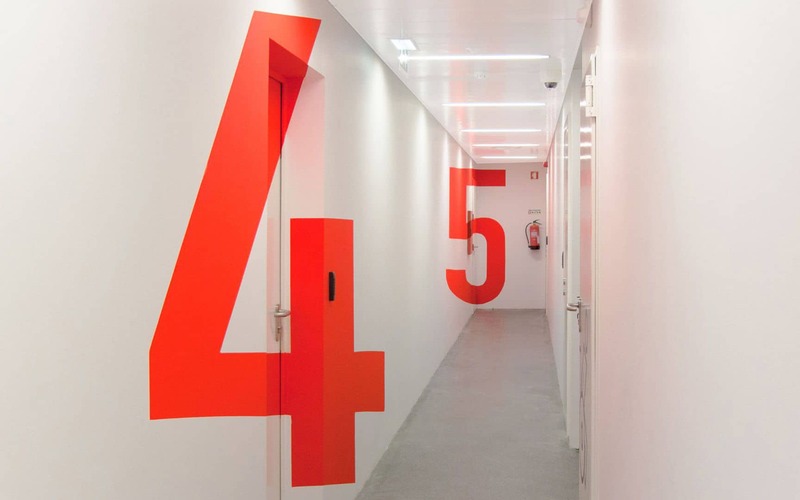 Wayfinding graphics like familiar toilet symbols and references to memorable points throughout the building can also be crucial in guiding your customers. Look for ways to make it as easy as possible for your visitors to know where they are, and where they’re going. 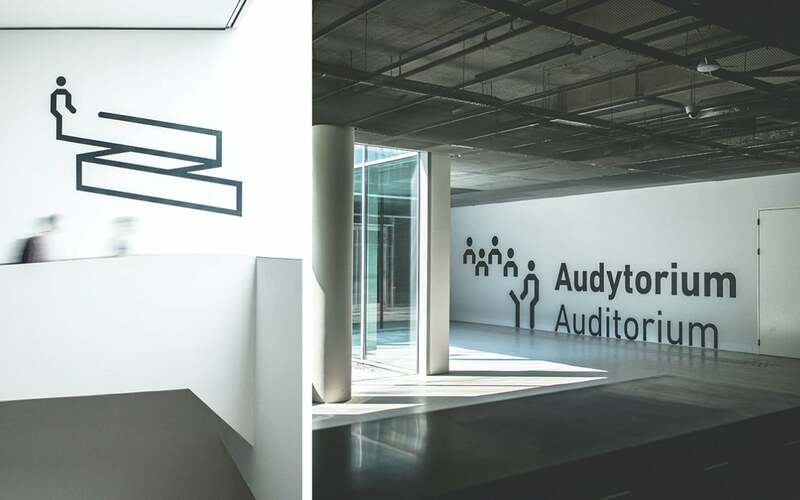 One of the things that make wayfinding design so complicated, is that brands need to find the perfect balance between creating distinct spaces and maintaining the same personality throughout the building. You want your wayfinding graphics to consistently remind your users of what makes your organisation unique and special, but you also need to set different spaces apart so that it’s easier for your customers to orient themselves. 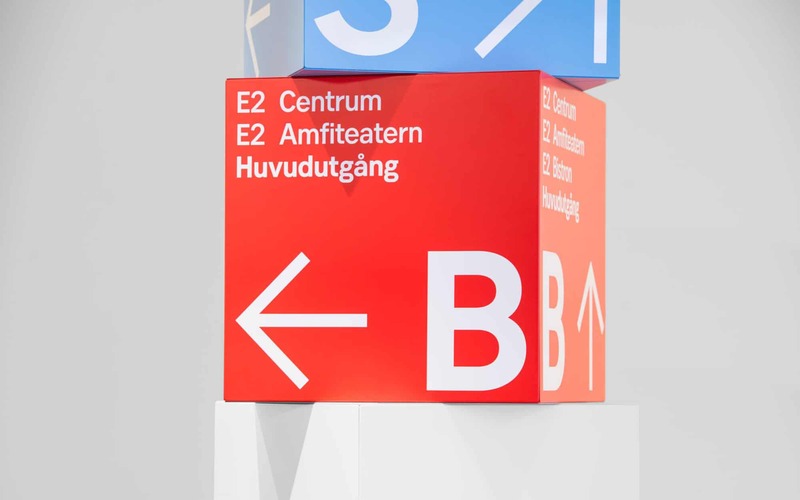 Wayfinding designers are experts in maintaining the visual identity of a brand within a physical space, while also giving each location context and focus. For instance, while the colours used in each section of your business might change to give your visitors an insight into where they are, the font and other branded elements will remain the same to add a sense of flow to the journey. Who are my customers, and what appeals to them? 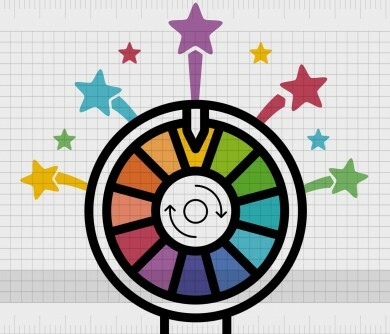 What kind of colours, fonts, and designs are most likely to earn their attention? Where will my visitors want to go when they visit this destination? How can I provide the simplest and most efficient routes possible? How can I set myself apart from my competitors and make this in-person experience unforgettable? 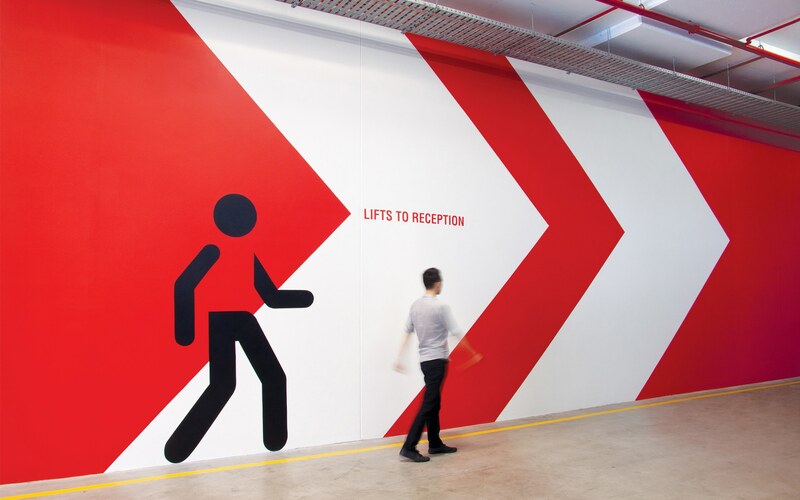 Wayfinding design is a world apart from any other graphical design strategy. 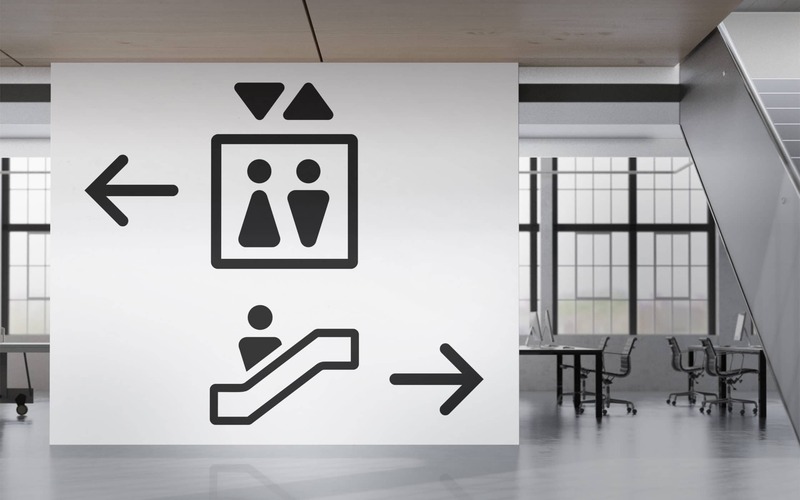 First, wayfinding is an offline experience, which means that designers need to think about how a person will interact with different symbols and images in a large, physical space. One of the biggest components of effective wayfinding design is knowing how to use sightlines. This involves understanding where your visitor will be at any moment and using their position to immerse them in the journey even further. Sightlines are a valuable way to add creativity to the informative nature of the wayfinding design process. With sightlines, designers can take the wayfinding experience beyond concepts like signage and wall maps and start to focus on the bigger experience of in-person customer interaction. Finally, if your wayfinding signage has a story to tell, you’ll need to design your space so that the message remains consistent regardless of which route your visitor might take. Just like with any design strategy, it’s easy to get carried away with your wayfinding graphics – particularly when you’re trying to create something that’s one-of-a-kind. However, it’s worth remembering that your systems need to be functional first. Don’t overwhelm your visitor with choices and look for ways that you can divide routes and spaces into easy-to-digest chunks of graphical information. For example, a large space could use multiple colour schemes and distinct visual attributes like different typography choices to make navigation easier. Wayfinding design is about making life easier for your customers, while simultaneously showcasing the unique nuances of your brand. In today’s competitive business world, modern companies should always be looking for new and improved ways to deliver a seamless, friction-free experience for their customers. Whether that means making it easier for someone to move through a website to the checkout page or helping a visitor to find their way around your office building, experience is everything. Good wayfinding design is more than just a way to direct people around your institution. 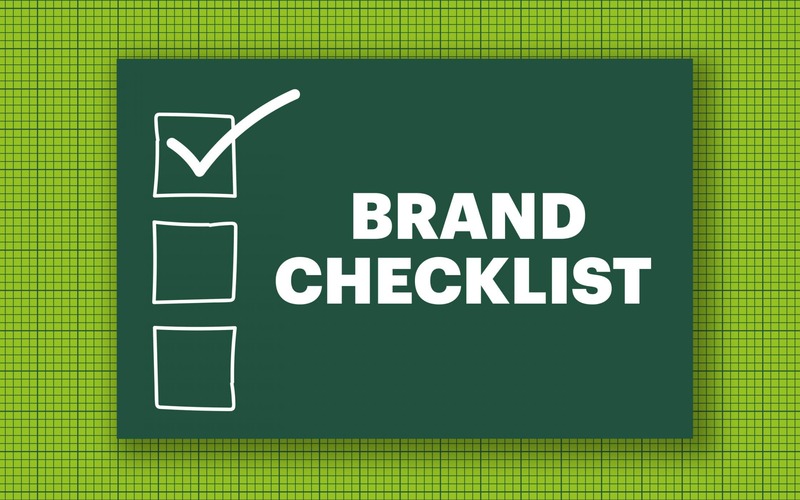 It’s a chance to reinforce your branding and show people what kind of company you really are. 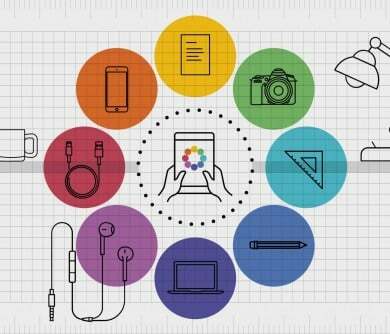 The right selection of materials, technology, and colours all come together to add yet another critical element to your brand story. 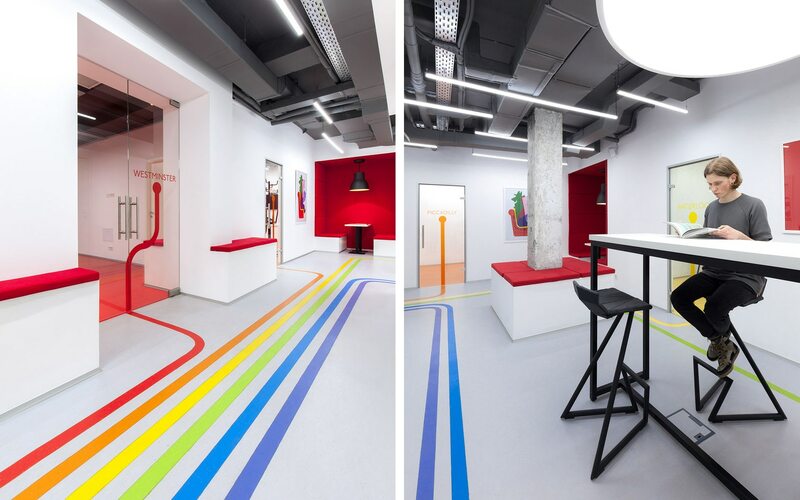 A colour-coded series of paths that lead to different areas of your building help to keep your customers on track, while tapping into the benefits of colour psychology. Unique branded photos and one-of-a-kind images highlight the nature of your company and could even give people a quick introduction to your team members. Themed wayfinding graphics make your directional systems more compelling and remind your audience of what your business is all about – like a movie theatre using signs in the shape of film rolls. 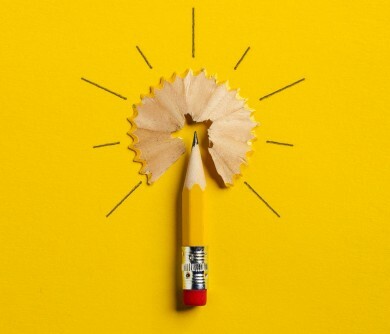 As we mentioned above, great navigation isn’t just about arrows and maps – it’s a human process, and a chance for companies to make a new connection with their customers. The more simple and effective your wayfinding solutions are, the more your clients will come to associate your organisation with frustration-free experiences. 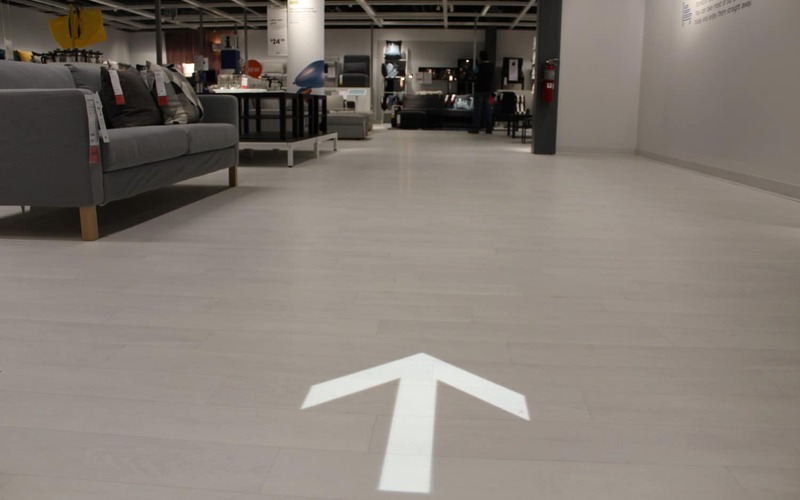 The projected arrows on the floor are simple, effective, and easy to understand. Combined with additional signage, they help to contribute to a streamlined shopping experience for Ikea customers. When customers visit a new or unfamiliar destination, the first thing they want is simplicity and clarity. They don’t want to ask at the first desk just to find the toilets – they want to see the little man and woman symbol that’s become a universal staple of the public space. A good wayfinding design process uses the perfect combination of symbols and text to direct your visitors. When symbols are designed with focus and care, they can speak to a universal audience, and give your visitors the guidance they need in a hurry. Combine that with easy-to-read typography, and you’ve got everything you need for effective and accessible business environment. Look at Fabrik’s wayfinding design for the University of Surrey for instance. 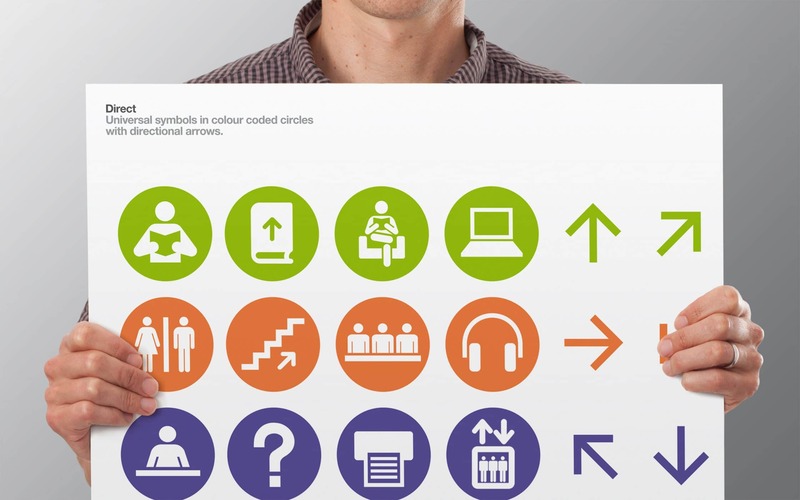 We used simple symbols, colour coding, and directional arrows to remove complexity from the navigational experience. 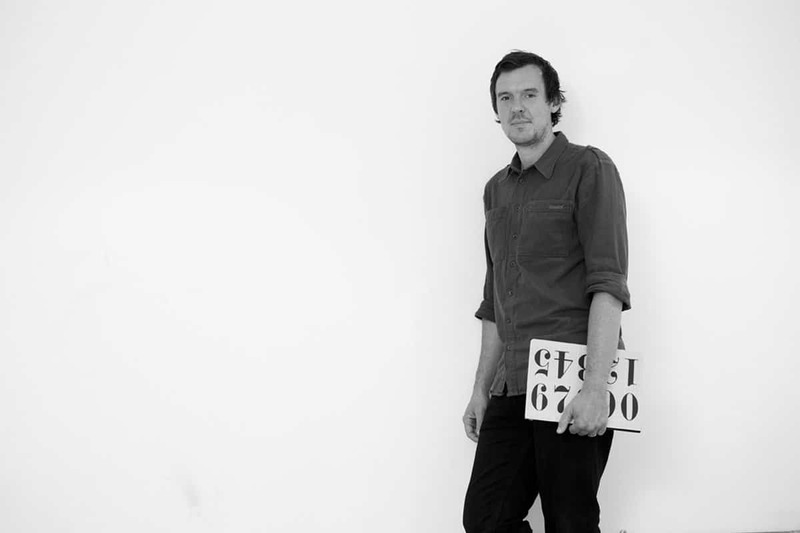 When it comes to creating your wayfinding systems, it’s worth remembering that less is more. Wayfinding isn’t just about adding signage to every wall so that your customers never feel lost. Too many graphics in one space can actually add to the confusion that a visitor feels, rather than helping to improve their experience. Instead of going over-the-top with your wayfinding design, speak to expert wayfinding designers, and ask them to help you map the decision points in your business. 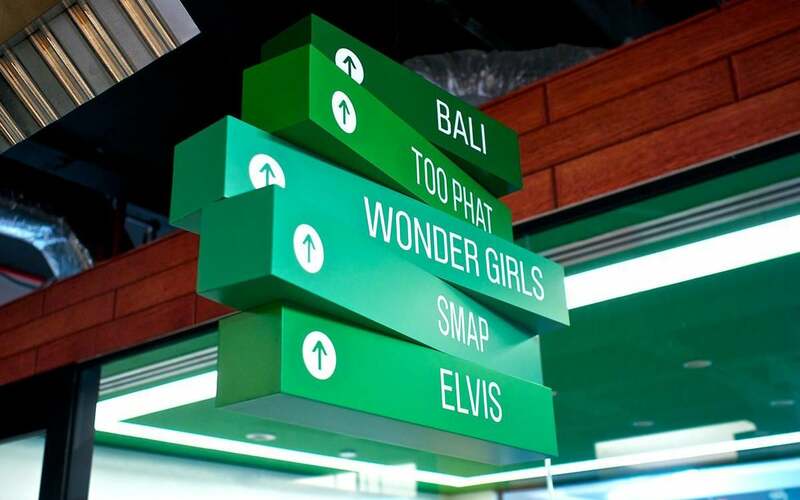 Finally, wayfinding signage isn’t just about making sure that your customers get to where they need to be. 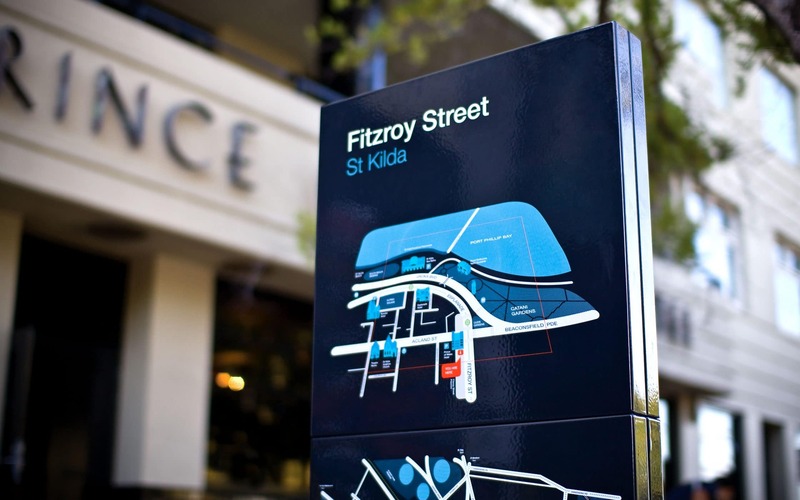 In the right environments, your wayfinding graphics can make up an important element of your visual identity. By creating one-of-a-kind wayfinding systems, you can help your audience to understand what makes your business so special. 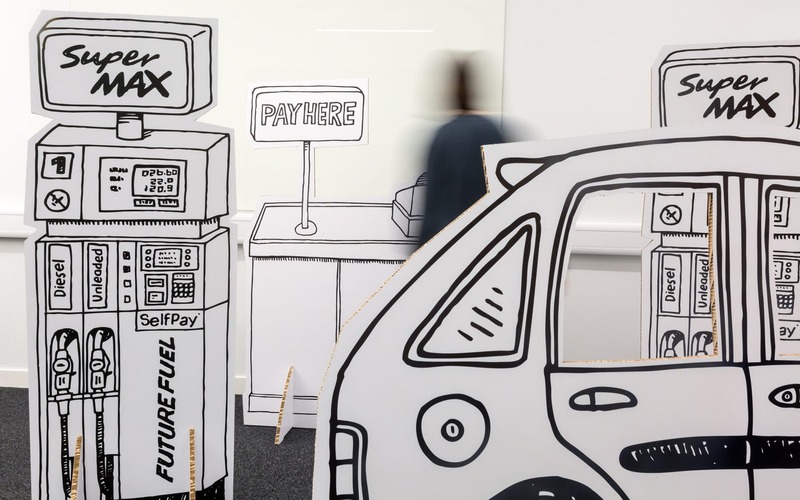 When Fabrik created the signage and wayfinding solutions for the Visa Design Jam, we used 3D props, illustrations, and state-of-the-art graphics to portray the quirky personality of the space. When you’re planning your wayfinding signage strategy, look for opportunities to define your brand in everything from the fonts you choose, to the style of wayfinding graphics you select. Sometimes, it’s easy to overlook the role that graphic design must play in our day-to-day lives. However, the truth is, without the branding efforts of creative brands, you’d have a lot more trouble finding the restroom, navigating museums, and exploring unfamiliar buildings. 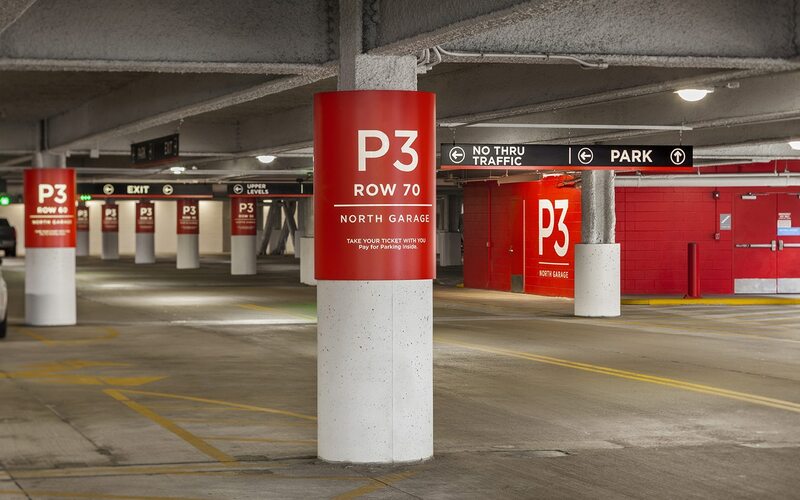 Wayfinding design is one of the branding components that we most often take for granted. Yet, by creating innovative signs, directories, and graphics, today’s brands can do more than simply help their customers navigate their stores and events. When used correctly, wayfinding is yet another way for the modern brand to build a relationship with their target audience, developing loyalty through improved experiences and exceptional customer service. Just like any other visual element within your brand identity, your wayfinding signage can showcase your unique personality, illustrate your story, and help your customers to grow more familiar with your organisation. When combined with your online branding efforts, your wayfinding solutions can help to bridge the gap between the different touch-points you use to engage with your audience. Wayfinding might not be the most exciting part of branding or the thing that today’s companies think about first when they begin to look for graphic designers to support their campaigns. However, when it’s used well, a wayfinding strategy can help you to map the path all the way to your customer’s hearts. What an interesting topic that I’ve never really considered before! Although it does make a lot of sense. I suppose the fact that I’ve never really noticed anything like that before is possibly a testament to how effective, yet subtle, the wayfinding design actually was! All the symbols used in this piece we notice a million times and never consider their greater purpose or strategy. I will definitely be sure to check out some of the author’s other pieces. Thanks for the great feedback, we hope you enjoy more of Stephen’s articles! The key to good wayfinding design is how well the navigator can accumulate wayfinding experience in the space. A big part of this is imageability, so the ability of a navigator to form a coherent mental image or map of it, if people can do that through the characteristics of the space that you’ve created then you’re really onto a winner. Navigators use landmark features to record past route-following experiences, a designed space that employs them should be more effectively navigable.